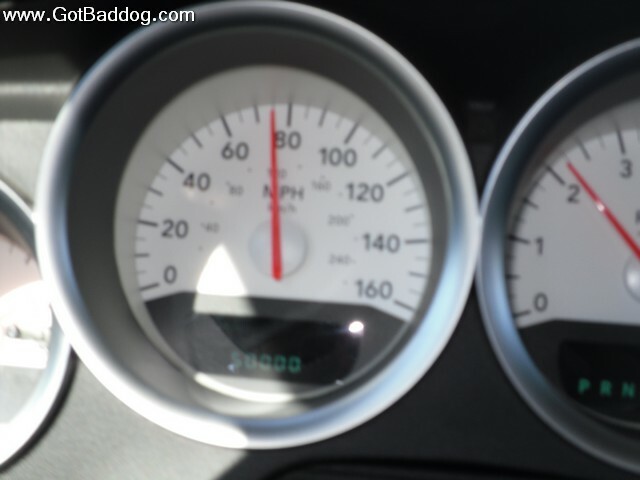 I remember flying to Tanya’s for the 4th of July 2009, and that my odometer on the Charger had turned 33,333 miles. The number stuck in my mind because I remember odd things like that, and it was about half of what Tanya had on her Charger, which she purchased a few months after me. In the first 3.5 years I averaged about 775 miles a month. In the last 16 months I have averaged almost 1,050 miles a month. Considering I do not drive to work, and I was in Europe for at least a month of that, that is a pretty hefty increase. My photo of the day for Black Friday is of my odometer as it turned 50,000. I think I am catching up to Tanya. It is Black Friday and the last thing I want to do is go shopping. Fortunately, some friends of mine went out to the desert to go dirt bike riding and invited me to come on out. I did not really take a lot of convincing. I loaded up the Charger with Buddy and my Canon and headed north on CA Hwy 14 out past Mojave to Cantil and an area known to the desert bike riders as Spangler Camp. It was sunny but brisk, but nothing a campfire or jacket could not take care of. I enjoyed the opportunity to spend some time with friends and to practice my action photography. I even found a nice set of wings that appear to have come from an owl. Too bad they do not like to cuddle as the wings were actually softer than the fur on a cat. After a fun evening in Santa Cruz we grabbed some coffee and headed down CA Hwy 1. It was another spectacular day and it held promise for some great coastline photos. We were not disappointed. The CA coastline actually faces north, south and west so depending on the direction faced the scenery can be quite different, from calm blue coves to tumultuous waves crashing on the gigantic rocks that are prevalent along the coast in that area. If you have never driven along the California coastline, you owe it to yourself to do it at least once. It is a very long, slow drive but it is worth every moment.